Tintin Heart: Bright Colours - Cards Galore Scrapbook Challenge and DT Call. Bright Colours - Cards Galore Scrapbook Challenge and DT Call. Today is the turn for my scrapbooking DT for the new challenge running over at Cards Galore Scrapbook Challenge until the 13th of September. The theme for this challenge is Bright Colours. 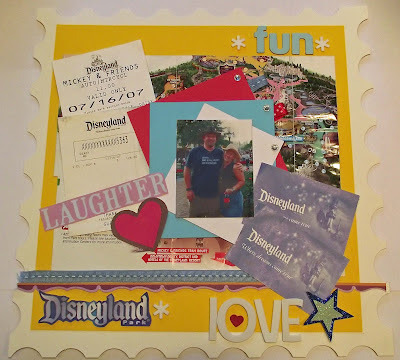 Mine is a paper scrapbook page and I've chosen a photo of my son and his girlfirend taken a few years ago at Disneyland. The bright cartoon colours that are so much a part of the Disney background are the inspiration for this page. Regardless of how old my son is, a trip to Disneyland is still on the agenda everytime. He just loves it! There are lots of photos of the trip, but very few of them together and this is one of my favourites. I'd seen a layout recently where the background had a printed postage-stamp edging and as I wanted this effect for my layout, I decided to make my own using a cream cardbase and a 1" round punch. Not bad for a first attempt! I also incorporated some of the tickets and brouchures that my son kept as mementos from the trip into the layout and used bright yellow cardstock to pop everything out. 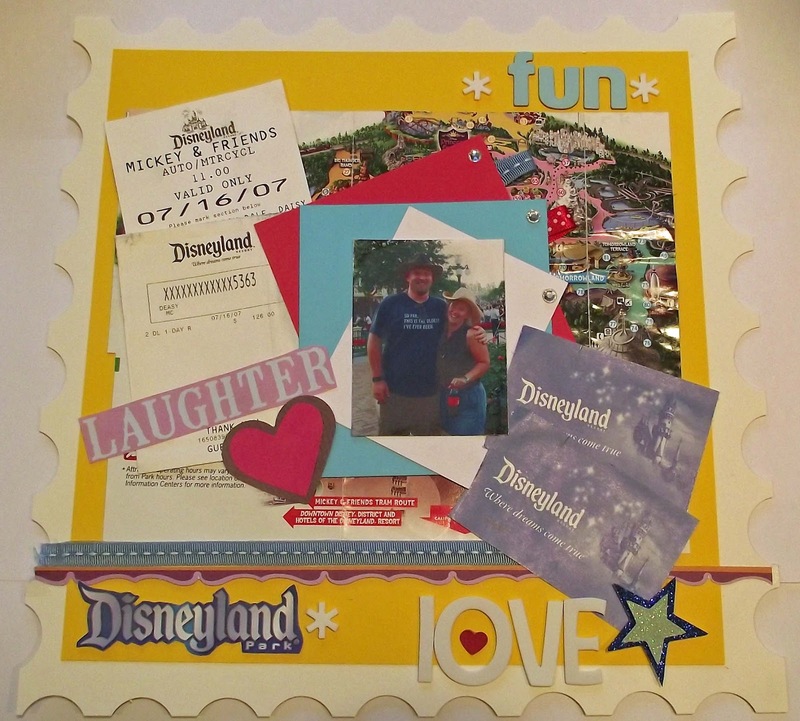 Some American Thickers for the lettering and a cut-out of the Disneyland logo complete the page. Please pop over the the Cards Galore Scrapbook Challenge and see the great range of DT talent on display. We have traditional and digi scrappers to inspire you and we are also looking for some new members for our DT. We are looking for 1 paper scrapper and 1 digi scrapper. If you would like to be considered, ENTER THE CHALLENGE and LEAVE A COMMENT letting us know you wish to apply, with the link to your blog.. Please also state if you are applying as paper or digi scrapper. 1 layout pr month following a set theme. Thank you for stopping by to read my blog and I hope you find time to visit and support the wonderful challenge blogs you see here. Your time and comments are appreciated.